The first version of Fast/Fold poker debuted in 2010, when Full Tilt Poker unveiled “Rush Poker”, a revolutionary and innovative form of poker that changed online poker. You would have expected competitors to quickly unveil their own versions, but with the threat of lawsuit hanging over the head of any online poker site that tried to copycat the “patent-pending” product, Rush Poker ruled the roost for well over a year; holding a virtual monopoly on Fast/Fold poker games. However, once Full Tilt Poker found itself in extremely hot water in the aftermath of Black Friday other online poker sites began poking the site and their willingness to bring about a lawsuit, and once their bluff was called the floodgates opened and Fast/Fold Poker games can be found at numerous online poker sites, including PokerStars, which launch Zoom Poker in March of 2012. Now, some nine months after launch (and several months after buying Full Tilt Poker from the US Department of Justice) PokerStars has finally added Zoom Poker tournaments to their lobby, something the poker world has been clamoring for all along, and was expecting far sooner, considering FTP had already launched Rush Poker tournaments back in 2010 without a hitch. Fast/Fold Poker has swept through online poker to become one of the most popular variants, with upwards of 25% of all online poker players participating in the lightning-fast format that instantly transports a player to a new table the second they fold their hand. Fast/Fold tournaments are a bit trickier to pull off considering that the player-pool (which is the reason Fast/Fold poker works) diminishes throughout the event, eventually getting to the final table which then reverts to a standard poker game. The current Zoom Poker tournaments at PokerStars were launched on New Year’s Eve, December 31, 2012, and are still in beta-testing mode at the moment, but seem to be drawing solid fields. Zoom tournaments are being offered at micro-stakes ($1 buy-ins) but the site is testing the tournaments in a variety of formats including Holdem and PLO, as well as in different structures like Turbos and Knockouts –I can’t wait for the short-handed, Zoom Poker Hyper Turbos, which should be akin to watching a movie on fast forward! Zoom Poker is available on the regular PokerStars client as well as the poker website’s mobile App. Considering the popularity of the format; PokerStars will probably see an even larger market-share once Zoom Poker tournaments are officially launched. • Fold, and you’ll immediately be moved to a new hand, at a new table. • You can fold at any point when you are facing a bet. You can even click ‘Fast Fold’, which allows you to fold even when it is not your turn to act. • Watch the end of a hand play out by holding the CTRL key when you the click the Fold button. • Available across Hold’em, Omaha and Draw games, at stakes ranging from $0.10/$0.02 up to $2.50/$5, with more games and stakes coming soon. You can even play for free! 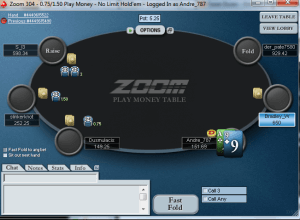 • Find Zoom tables under the ‘Zoom’ tab in the PokerStars lobby.